In Blert, Jordan Scott has taken a lifetime of stuttering and turned it to audacious advantage. There are no arm’s-length accounts of stuttering here. Rather, Scott recreates his experience of language as a resistant physical medium—where every vowel and consonant must be traversed, claimed, made audible by non-stop bodily effort. And for the non-stuttering reader, the effect is boggling. As the initial disorientation begins to clear, our familiar relation to words is both dislocated and clarified. I also dig the pure racket, thumpology and bang-on-a-can exuberance of these tonguetide riffs. Scott takes us down to the basement of words, where sound and rhythm rule, and poets learn their craft. Blert is a strange and gorgeous work of linguistic materialism. 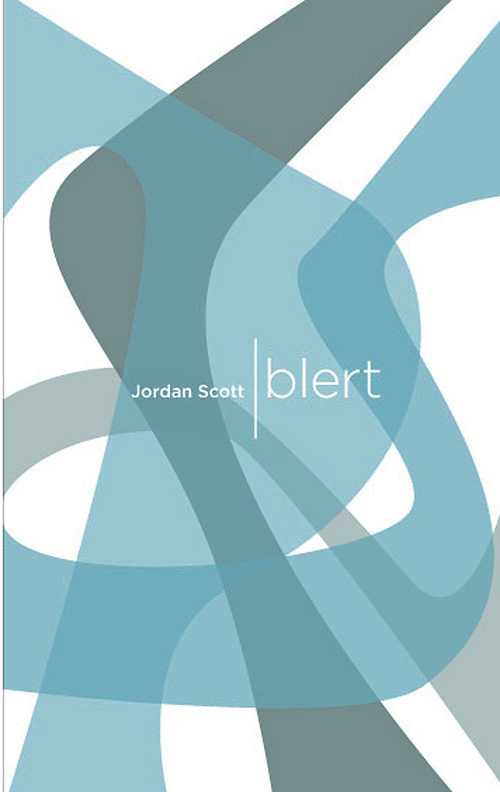 Jordan Scott’s Blert is the most original poetic project I have read in years. Undertaking a ‘poetics of stutter,’ the book is not primarily a mimetic representation of stuttering, or the reproduction of stammered speech, but rather an investigation into how the stutter originates. Enacted rather than named, the stutter here is thus no longer an affect registered in language, but rather an effect of language. At once an intimately personal confession and a coldly statistical abstraction, Blert defines itself in the same way Paul Valéry defined poetry: a prolonged hesitation between sound and meaning. Originally from Coquitlam, British Columbia, Jordan Scott now wanders between the Pacific and the Shield. Jordan’s first book of poetry, Silt (New Star Books), was nominated for the Dorothy Livesay Poetry Prize. In the fall of 2006, Jordan worked on the final sections of blert while acting as a writer in residence at the International Writers’ and Translators’ Centre in Rhodes, Greece. Jordan spends the spring and summer slinging canoes at Pitt Lake, the largest freshwater tidal lake in North America.